Santa Maria is a wonderful place to live. Located in the heart of the Central Coast, we have great weather with lots of sunny days! We love our sunshine, but not the damaging UV rays that come along with it. Sun exposure takes it’s toll on our homes, fading wood flooring, carpets, drapes etc. Even our own skin is compromised by the UV rays that go right through unprotected glass windows. Apex clear home window tinting films block the UV rays without obstructing visibility. For the windows where you would like more privacy, without sacrificing natural light, we have a nice variety of decorative window films, including opaque, frosted and one-way options to choose from. The strong rays of the sun can make us uncomfortable, it’s true, but they can also cause real damage to our furniture, flooring, draperies, and more. Sun damaged items can devalue your home, or create costly replacement requirements. Our skin is even vulnerable while we are inside our homes, did you know that damaging UV rays pass right through unprotected glass? Most of us are good about applying sunscreen when we are going to be outside in the sun, but who ever thinks about putting it on when we are inside! Solar window tinting film installed by Apex will reduce UV rays by up to 99% in your home! Home security is on a lot of homeowners minds these days. Apex Security Film window tinting keeps glass from shattering as easily. Flying fragments are less likely if a window does get broken, which is important for areas where this could hurt someone – a nursery or child’s room are good examples. Of course nothing can completely stop a determined individual from breaking in, but every precaution we are able to take helps! Apex Security films ranges in thickness from 4 mil. to 15 mil. These films make it much more difficult to break apart and get through. Every second that delays an intruder gives valuable time for help to arrive. Think that having window tinting installed will make it too dark? Often people are worried that window tinting will look dark on the outside of their home, or will keep the light from getting in and make it too dark inside. But with the advancements made in technology this no longer needs to be a concern! 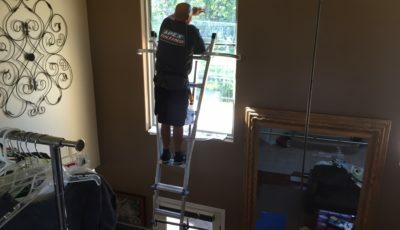 Apex works with you to achieve your perfect balance of the natural light you desire, and the added protection you want for each one of your windows. Give us a call and let us show you the window tinting films of today! Keeping out the heat, means we can keep the energy bills down, repairs and replacements aren’t needed as frequently. Stop covering up your windows to keep out the heat of the sun. Curtains or blinds may block sun light from coming in, but they also block your view and they don’t keep the heat from getting in and being trapped inside. Our window tinting film won’t block your view but it will block out unwanted heat before it enters your home! This can keep your energy bills lower, and your A/C unit will be happier that it doesn’t have to work so hard!